I grew up in the South, which means that a lot of the food that I ate had to be home-cooked. But now that I’m in college, it feels a lot easier to justify running to the grocery store to grab that last sad looking pumpkin pie than to take the time to destroy my tiny apartment kitchen so that I can bring a deflated, burned “pie” to dinner with me. Whether you’re headed to a laid-back Friendsgiving or trying to prove to your family that you’re finally an adult at Thanksgiving dinner, you can arrive with an easy to make and delicious dessert. Is your stomach grumbling? Ready to try these easy AF Thanksgiving desserts? 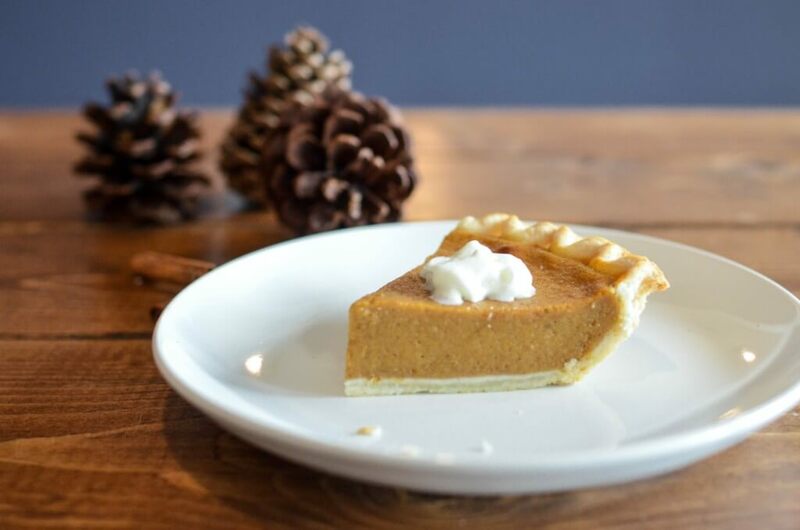 What would Thanksgiving be without pumpkin pie? Taylor Kicklighter, a student at Kennesaw State University, loves pumpkin pie because it reminds him of home. With this five-ingredient dessert, you get all the taste of a classic pumpkin pie without fighting your way through the grocery store to fill up your cart, which means more time to finish the new season of Stranger Things while your pie bakes. Get the recipe here. Rik Collier-Bridges Tiate, an African American studies major at the University of Alabama in Birmingham said that he always looks forward to an old-fashioned cream cheese pound cake as Thanksgiving desert. But what if you just don’t have the cooking chops to make this southern classic? You put a new spin on an old favorite. With this recipe, you can use store bought pound cake to make a delicious dessert, perfect for fall. Get the recipe here. With this recipe, you get to have crescent rolls with dinner and dessert. Plus, it takes less than an hour for you to make this treat that has all the flavors of a fresh, traditional apple pie. The recipe also includes nutrition facts so that you can know just how bad you should feel about eating the whole platter before you get to dinner. My sister has been making pumpkin gooey butter cake since she was in high school and just starting to learn how to bake. It comes out perfect every time with no cooking skill required. Since it belongs to the Paula Deen repertoire, you know that it’ll taste absolutely delicious and completely horrible for your health. In other words? It’s perfect for Thanksgiving. This recipe has many different variations, so pumpkin haters rejoice because you can enjoy this dessert, too. Get the recipe here. Jennifer Stanton, a student at the University of Georgia, loves to eat cheesecake with her Thanksgiving dinner. “It’s not too sweet but it’s still rich and creamy and delicious,” she explained. The best part about making a no-bake cheesecake? You can literally just mix the ingredients, pour it into a pie crust and then leave it in the fridge while you enjoy your Thanksgiving dinner—multitasking at its finest. Get the recipe here. Slow cookers are the lazy chef’s favorite tool. “Set and forget” isn’t just a saying, it’s a way of life, so if I can make dessert by just dumping a bunch of stuff in the Crockpot, then that will become my new go-to recipe. Cooking this dessert “low and slow” gives you a thick, creamy sweet potato casserole that goes great with marshmallows or a mix of brown sugar and pecans sprinkled on top. Plus, think of all the valuable oven real-estate you’ll save by making dessert in a slow cooker. Get the recipe here. The classic pecan pie mix tastes even better when made in a muffin tin. Mini pies are a delicious single-serve dessert. And they’re the perfect food to carry back in your hand when you run out of room on your plate. “I’m one of those people who prefers more crust to filling, so these are perfect,” added Kara Farmer, a political science major at the University of Georgia. Get the recipe here. Perfect for when you want to feel a little fancier; you can still get the creamy texture of pumpkin and a spicy kick that makes it perfect for fall, but you can cover these balls in chocolate, which makes everything better. Also, you can choose what kind of chocolate you want, which means you get variety while still only having to make one dessert. Get the recipe here. The crisp flavor of the apple will help to cut some of the sweetness from the chocolate and caramel, and you can feel a little better about yourself for eating fruit for dessert. With these apple slices, you can also decide how much chocolate and caramel you want to add. So, if you’re not a huge sweets person or want a slightly healthier option, add a little (or no) drizzle. Plus, they come on a stick so they’re portable, which means that you can eat it while you’re walking off all that turkey that you just ate or while watching football on the couch with the fam. Get the recipe here. Chocolate covered pretzels serve as the perfect easy dessert for anyone not that into sweets or that loves a treat that tastes both salty and sweet. The super simple recipe can even be a fun way to get your baby cousins involved with making dessert. Get the recipe here.